With temperatures soaring above 115 Degrees Fahrenheit in Tucson, I was extremely happy to join Debbi Bird's Wednesday Walk-about on the mountain. Thank you, Debbie and Bill Kaufman for inviting me! 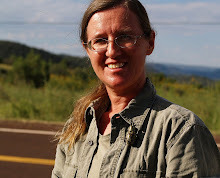 We headed from Summer Haven (elevation above 8000 feet) up Turkey Run, but the outings of that little group of naturalists are probably never runs or strenuous hikes but leisurely walks to observe birds and plants. With my enthusiasm for every crawling bug I slowed them down even more. People and bugs were very gracious about it. Birds less so - they wanted us to move so they could get on with their business of raising chicks. There went my bugs! 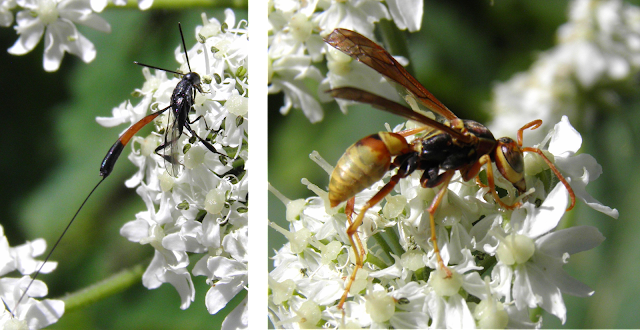 Heracleum lantanum, Cow Parsnip, those super-umbels, where in full bloom, yielding not the hoped-for longhorn beetles but delicate little Carrot Wasps (Gasteruptionsp.) and much sturdier Vespids. The larvae of Gasteruption are predators or predators-inquilines (consume larval food, not the larvae) of other Hymenoptera that nest in twigs and in wood, hence the long ovipositor. Paper wasps are eusocial colony builders who hunt other insects as food for they larvae. But the guy in the picture is a drone, a male, just out for his own indulgence in sweet nectar (note the hooked antennae). On the sloping forest floor a little Ericaceae is hiding in deep shade. But Bumblebees love heather and all its relatives, so Bombus melanopygus (southern color form) zoomed in and put the flash of my mini camera to the test. 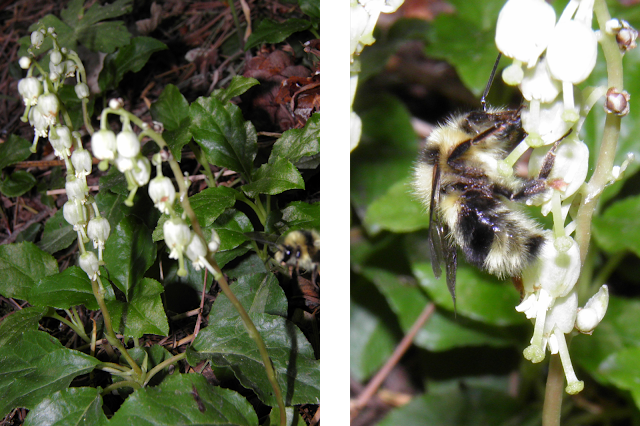 Luckily, the photo turned out well enough for an identification by our bee-wizzard John Ascher. On the leaves of Silver-leave oak little ant-like wasps were running about. There tiny wings seemed non-functional (?) enhancing the ant similarity (there will be a follow-up blog to this topic). Another Wasp, Tenthredinidae (Common Sawflies) - these are vegetarians and no threat to the beetle. The larvae feed on pine needles or leaves, looking like caterpillars with extra legs, usually feeding in groups. They take on a characteristic s-shaped position when threatened - and most predators recognize it as a warning of their high toxicity. The wasp probably landed on the beetle just because - there were so many of them. 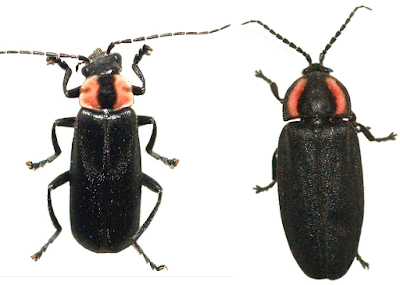 It seemed that the Superfamily of the Elateroidea which includes Click, Firefly and Soldier Beetles was having a big party, or rather fertility ceremony on this first day of summer. We first found the Soldier Beetle Discodon bipunctatum, which I nearly mistook for a firefly. No wonder, he's a close mimic of a toxic beetle in that family (I'm not sure if the soldier beetle, a Cantharid, is toxic as well, it might be, it shares it's name with the substance Cantharidin, but that is supposed to be a historical misnomer) . 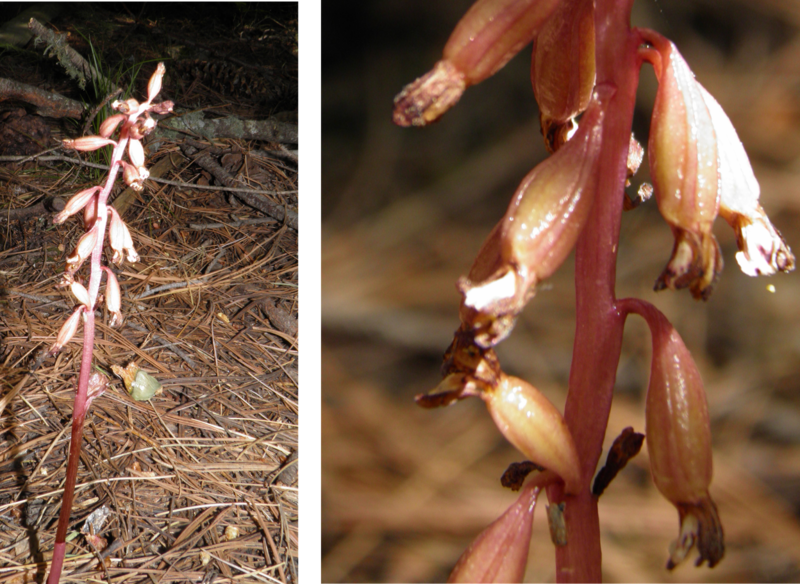 Soon we also found the Firefly Ellychnia corrusca (diurnal, no flight display of lights at night). Extremely common. More obvious even than the Fireflies were their other relatives, the Net-winged Beetles (Lycids). Not only are they all red or orange, they were also drifting leisurely in the warm summer air, landing on us and every other surface and congregating along water seeps. 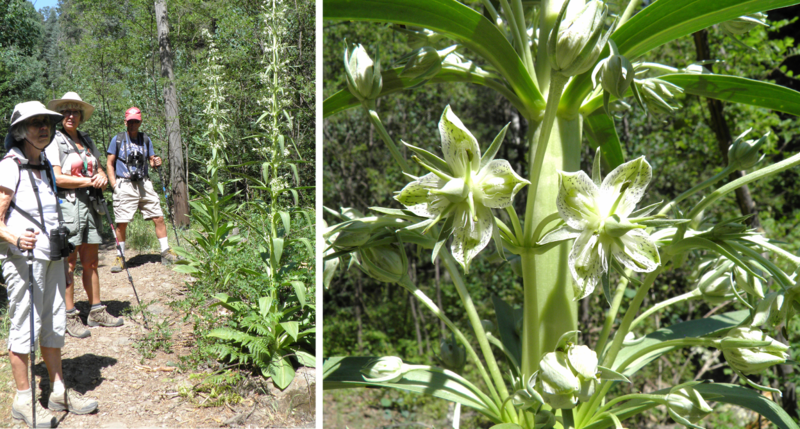 Lygistopterus rubripennis, then a little higher up mostly Lycus fulvellus femoratus. Of course, elevation was not the only changing parameter - we also came closer to some running water, the canopy cover increased and the temperature increased as the day progressed. Lycus arizonensis at least was not found on the way up, but rather common on the way back later in the day. Anyway - it was nice to see four of these rather impressive beetles in great numbers in short succession. 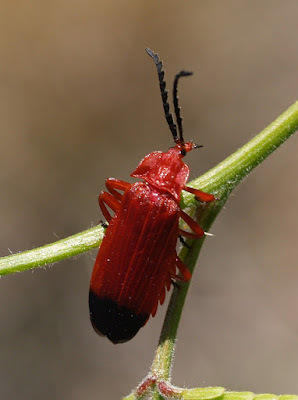 I'd like to point out that the red Lycid with black wingtips that is commonly found in lower Sabino Canyon is another species: Lycus sanguineus, the Blood-red Net Wing Beetle. 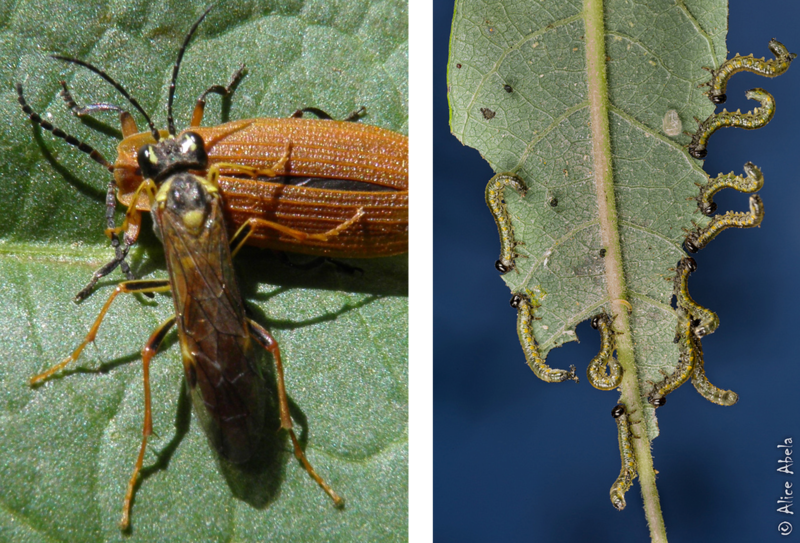 Leslie Eguchi has added her excellent insect photos from our trip to the flickr album. Thank you, Leslie! At the moment, we also have a proliferation of little black Seed Bugs Melacoryphus lateralis (left). These can occur in very large numbers on Sabino Canyon trails and under porch lights in town, so just about anywhere. 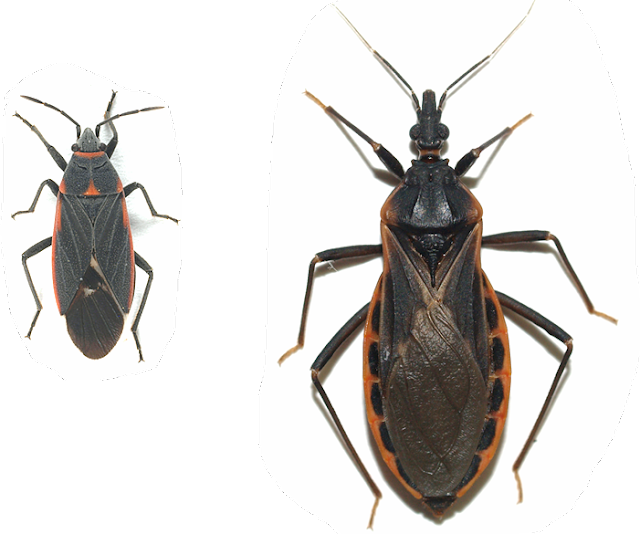 While Kissing Bugs (not much smaller than 1 inch) are also not dangerous - we had NO proven, KB transmitted cases of Chagas disease in AZ - the little Seed Bugs (about a quarter of an inch) are completely harmless - not even a garden pest.